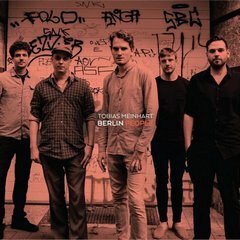 For his album 'Berlin People', Saxophonist Tobias Meinhart wanted to bridge the musical cultures of New York City and Germany by recording with a band of his German peers and an American jazz guitarist who has made Berlin his home, the great Kurt Rosenwinkel. The dream of many international jazz musicians is to experience the jazz life of New York City. Meinhart had the same dream and made a move to the City from his native Germany a decade ago. Having lived in New York for ten years, he came to the realisation that a young man from Bavaria can never be from Harlem and that his German roots are central to his musical identity. Kurt Rosenwinkel has been regarded as a firebrand on the guitar and a much-copied stylist. His vocal-like sound has become a touchstone for every guitarist coming up after him. He had relocated to Berlin, at nearly the same time that Meinhart moved to New York, to head the jazz department at the Jazz Institute of Berlin. Rosenwinkel has made Berlin his home base.